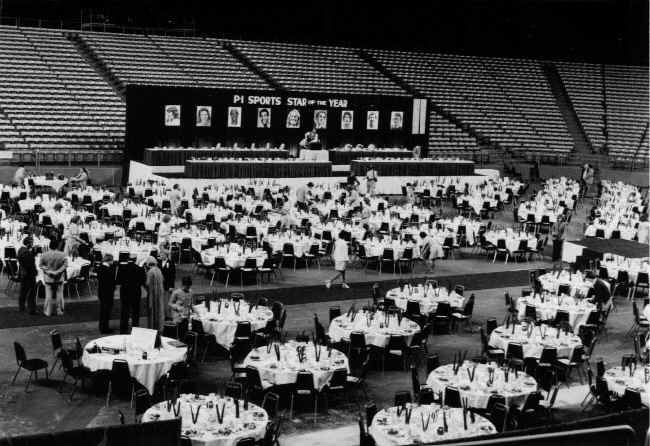 Setting up the playing area of the Kingdome for the 1980 Seattle P-I Sports Star of the Year Banquet. 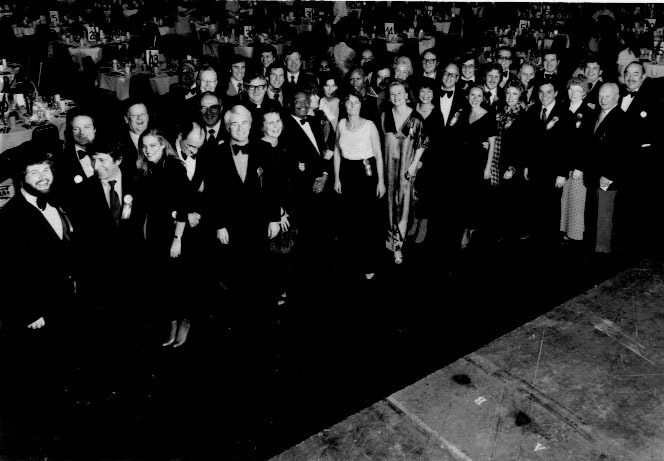 Seattle City Councilman Sam Smith, Jerry Burtenshaw, Angie Burtenshaw and others who shared Table 3 at the 1980 Sports Star of the Year Award. 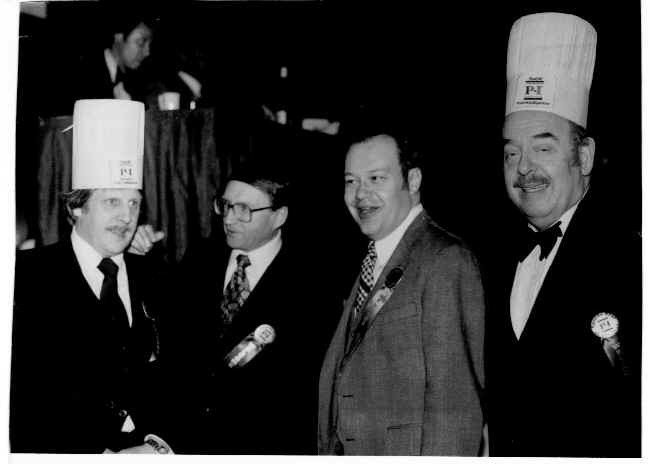 Here's John Franco of Franco's Hidden Harbor Restaurant, ____, Wash State Senator (later U.S. Congressman) Jim McDermott and State Legislator (later Governor) Mike Lowry. U.S. 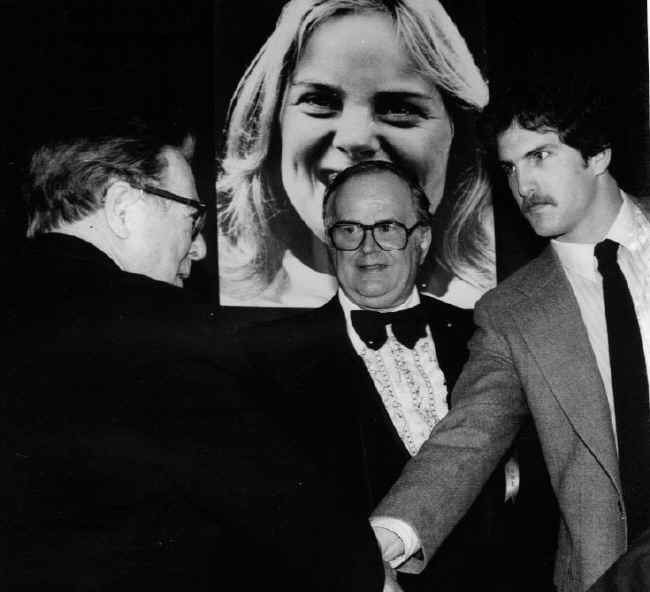 Senator Warren G. Magnuson shaking hands with Sports Star nominee Joe Steele of the UW Huskies Football Team. Joe was the guy who broke Hugh "The King" McElhenny's rushing record. 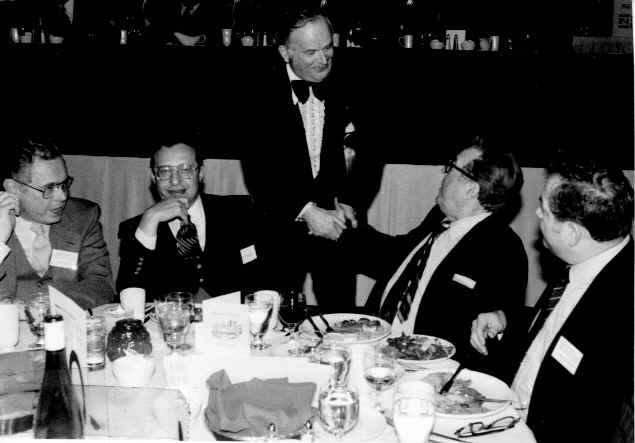 You can't have a banquet without food, so here are Roger Hoen of Alpine-Ogden, caterers at the Kingdome, and Victor Rosellini of Seattle restaurant Fame (Rosellini's Six-10, 410, and others.) 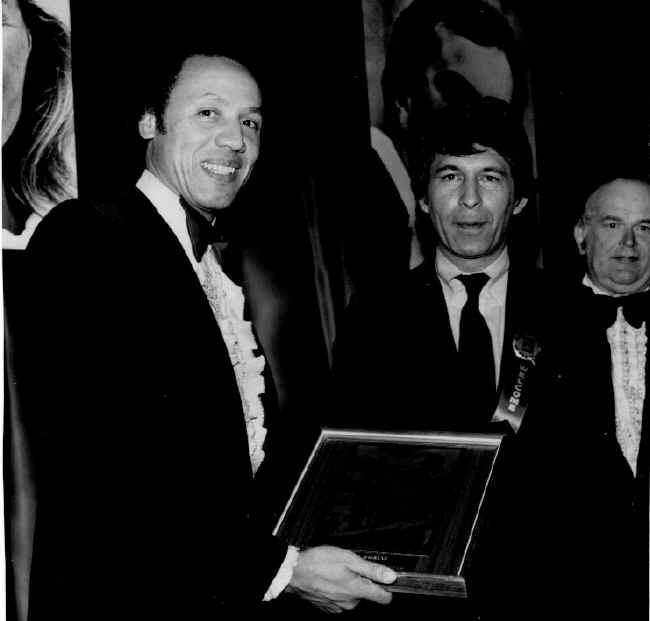 Both Victor and Roger were active in the Restaurant Association. 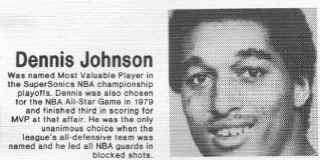 Anyone remember the Seattle Sonics? 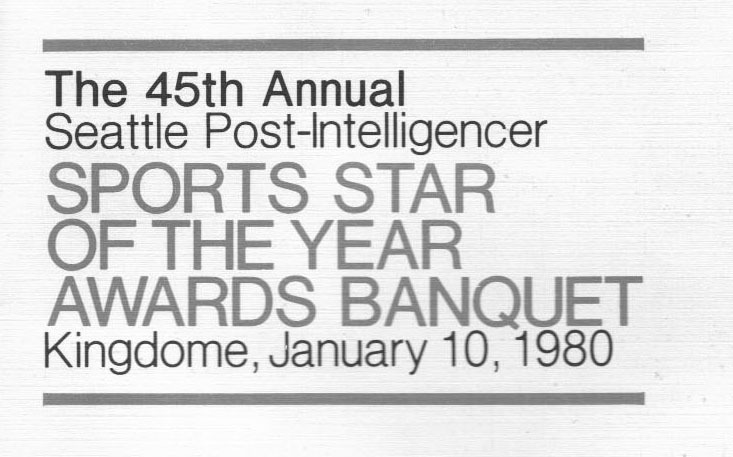 Well here's Seattle Mayor Charles Royer presenting a plaque that didn't photograph or scan very well to Lenny Wilkins, coach and player of the 1979 World Champion Seattle Supersonics Basketball Team. 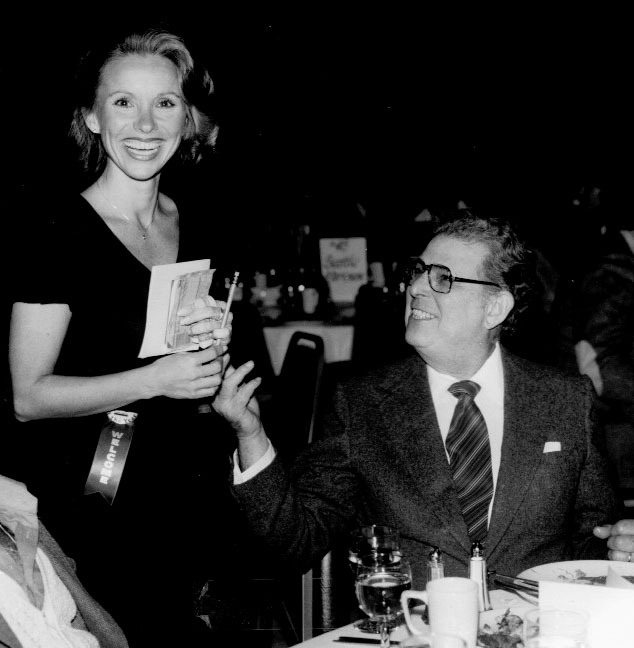 Yes, that's our very own Emcee Jack Gordon in back. What a crowd turned out for the Sports Star of the Year Award. Started by the P-I's Royal Brougham in the 1930's they have a long star-studded history. 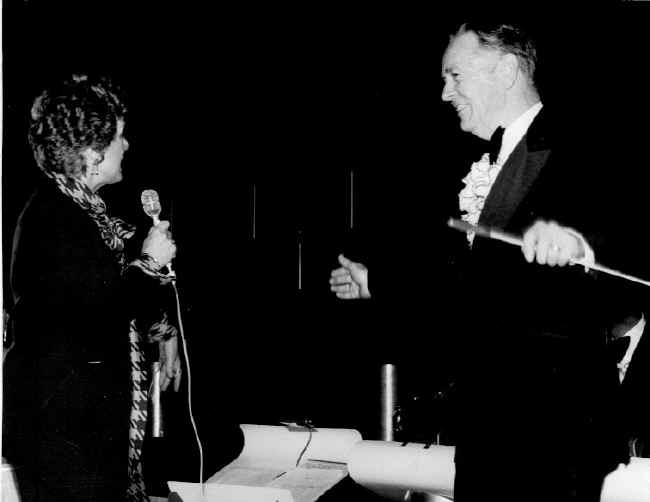 Jack Gordon was the Master of Ceremonies of the event for decades. 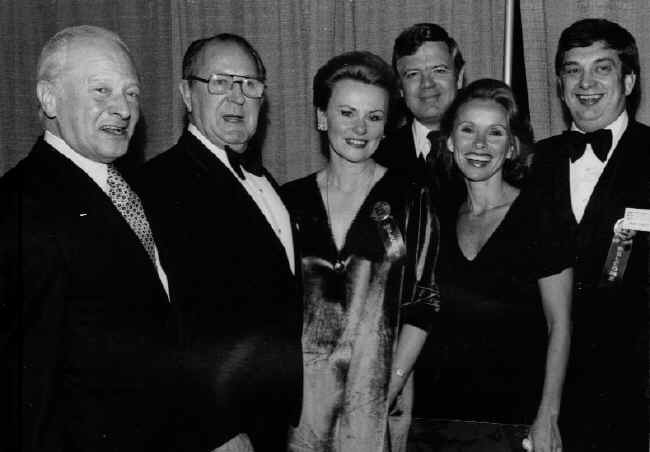 Here we see (hiding in the back) former Seattle Mayor Wes Uhlman, Marcia Rosellini, Robert Rosellini, Seattle Mayor Charlie Royer, a lady, a man, another lady, soon-to-be-former State House Co-Speaker John Bagnariol, and another lady. What a piece of history. Seattle broadcaster Wayne Cody is interviewing Washington (Lieutenant) Governor John Cherberg, who was one of the first Sports Men of the Year, having won in 1937 for his outstanding coaching at the U.W. Jack Gordon welcoming U.S. 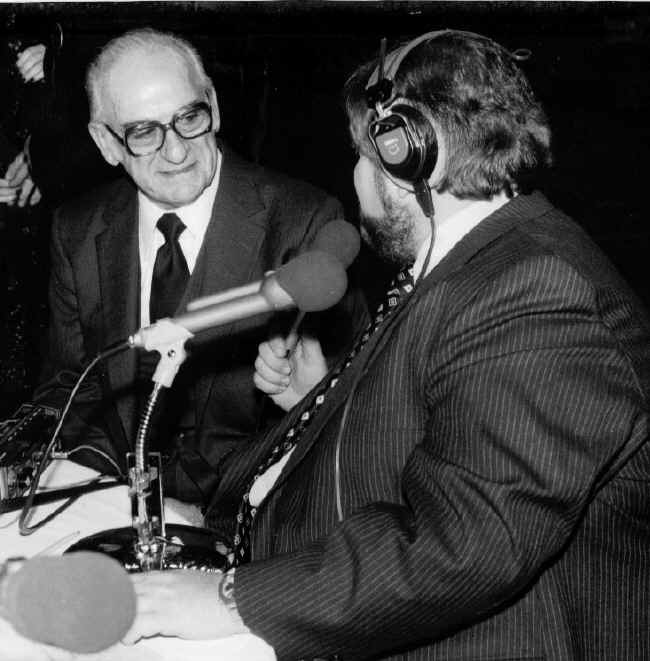 Senator Warren Magnuson (defeated after 36 years in the Senate by Slade Gorton in November, 1980) and the P-I's editor Virgil Fassio. 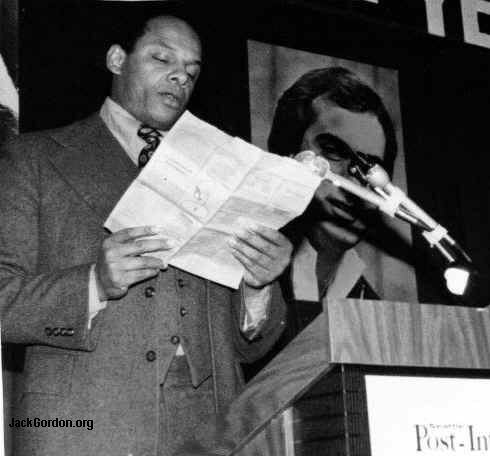 George Raveling, coach of the WSU Men's Basketball Team, was a special guest at this banquet. George was in his 4th year as WSU coach and had amassed a .567 winning percentage at Pullman. What's a Jack Gordon arranged event without the sounds of Max Pillar and his orchestra. 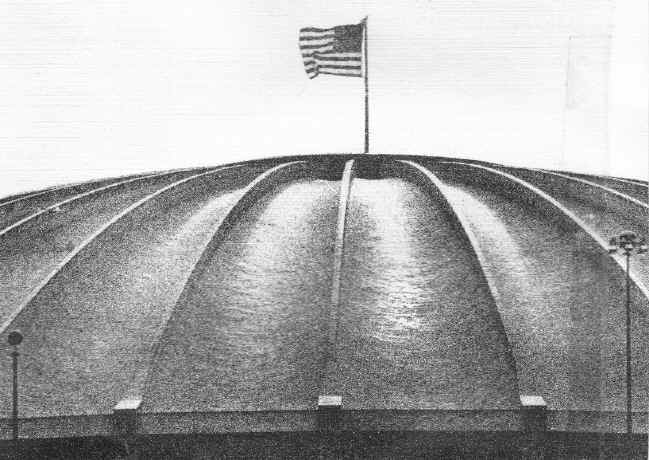 Nationally known, Max died in 2002 at the age of 89. She's turned so I can't see her face but that sure looks like the Kingdome's Media relations Director Carol Keaton. These must be the VIPs at the banquet. A pre-banquet shot by John E Walker. This group is anchored at one end by Bill the Beer Man and the other end is held down by Seattle's Victor Rosellini. 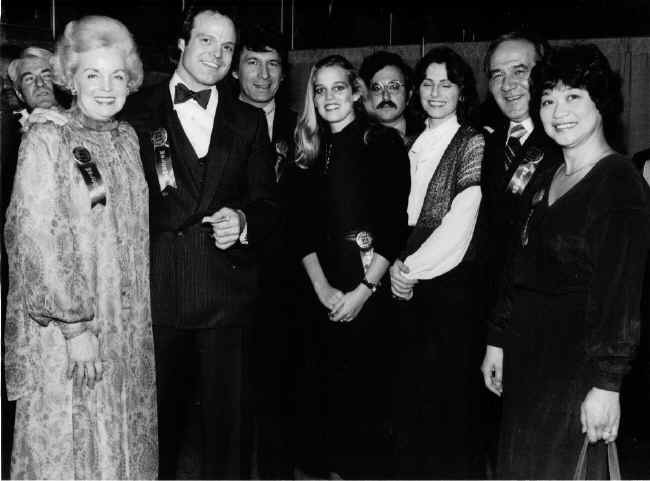 (If you recognize any of the people on this page, please let me know at johnr@jackgordon.org. 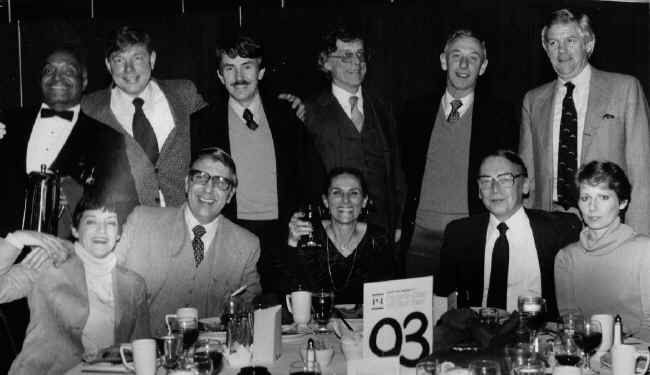 From an earlier Sports Man of the Year Dinner, we have a picture of Table 38. 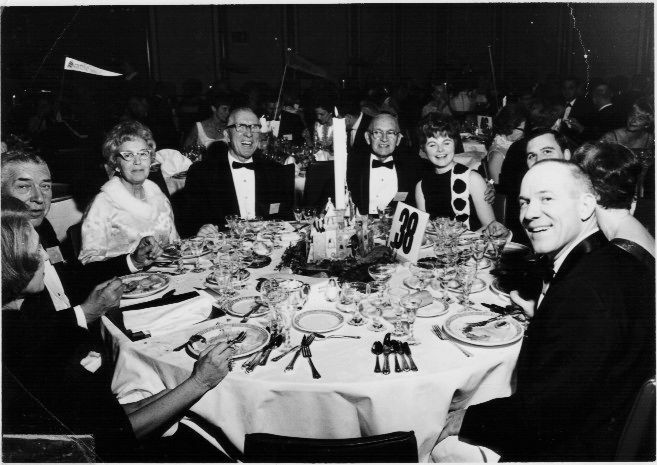 That's Royal Brougham, Seattle P-I sports writer for many years and creator of the Sports Man of the Year just to the right of the table candle.